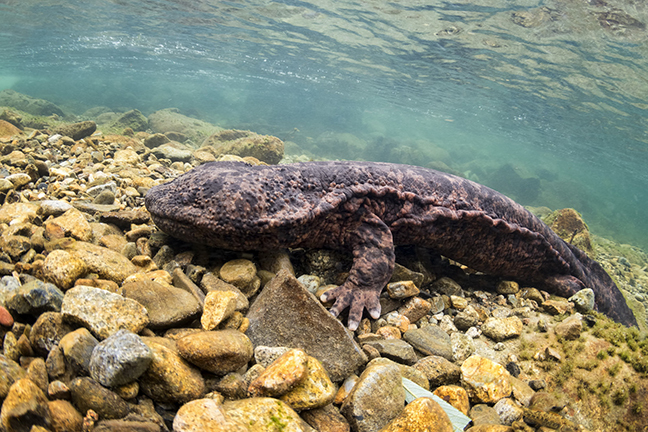 The Japanese giant salamander is a quite unique, if rather mysterious, creature that lives in rivers across western and southwestern Japan. Japanese giant salamander. Photo by Don Silcock. As both its common and Latin names (Andrias japonicus) suggest, it is an endemic species of Japan that is both protected under federal legislation and formally nominated as a special natural monument because of its cultural and educational significance. The Japanese giant salamander is indeed quite large, reaching up to 1.5m in length and 25kg in weight, which together with its large mouth and rather strange features gives it a quite formidable presence—at least when you first come face to face with one! They possess a quite amazing ability to burrow down into the rocks of the river beds, something they do head-first, and given their overall size really does make you wonder how they turn around down there, because when they do re-emerge they are face-first. 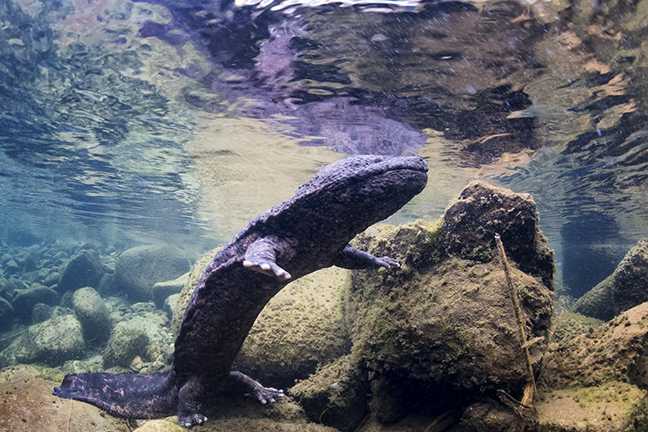 Despite its name, the Japanese giant salamander is not the largest salamander in the world. That prize goes to the closely-related Chinese giant salamander, which can reach 1.8m in length and up to 50kg in weight. Critically endangered in China, the Chinese salamander was introduced into Japan for commercial reasons in the early 1970s but now poses a threat to the Japanese version, as the two species are known to mate, which has created a hybrid variant. The Chinese version has a reputation in Japan of being much more aggressive than its local cousin, which is distinctly sloth-like when observed during daylight hours. 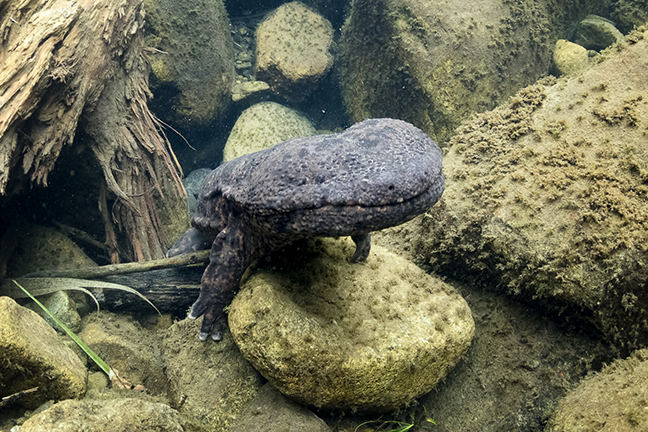 Japanese giant salamanders are nocturnal, and because they lose their gills when they are very young, they must interrupt their daytime slumbers to obtain air, something which they do by either rising to the surface to breath, or—in highly oxygenated, rapidly-flowing water—they can absorb it through their skin. Being in the water with these creatures is an interesting experience but is one that involves quite long periods of inactivity, because while they slumber down in the river bed rocks, you must wait patiently on the surface. The salamander’s breathing cycle is about 30 minutes and looking at rocks while you wait is not exactly exciting. Then, you suddenly notice a rock that was not there the last time you looked, but it is not a rock, it just looks like one. It is the salamander starting to re-emerge. What follows then is a slow and cautious crawl up the rocks, followed by a quick dash to the surface and a scramble back down into the riverbed—kind of a drive-by salamandering. Photographing the Japanese giant salamander can be a rather challenging because being nocturnal creatures, they are quite timid during the daylight hours. 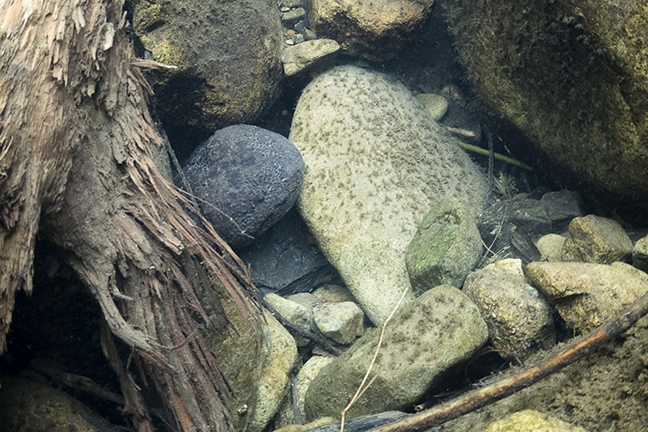 They are also very well-camouflaged, and their brown and black mottled skin allows them to blend in extremely well against the river bottom. Plus, as they spend a significant amount of time burrowed in to the river bed, you must actually know where to look for them in the first place, which means that a guide is essential. Their small eyes, poor vision and nocturnal nature means that they are very sensitive to light, so there is no way to use strobe lighting without harming them and so natural light is the only option. And, being quite large animals, a wide-angle lens is the way to go. I personally used the versatile Tokina 10-17mm lens with my Nikon D500 and Nauticam housing. The salamanders emerge into the river at night when they feed on insects, frogs and fish. During the day, they are quite slow and sluggish, apart from when they rise to the surface to get air, which is when they move quite quickly—probably because they are most vulnerable at that point. I think the mid-water shots of the salamanders are the most interesting, as they seem to bear more than a passing resemblance to ET at that moment—but you have to be quick, as they do not linger. As I mentioned before, they need to take air about every 30 minutes. So, the cycle I got into during the two days I spent with the salamanders was roughly this: Around 25 minutes of rock-watching; followed by a few minutes of cautious movement as they first start to emerge from the river bed; and then about a minute of hurried activity when they rose to the surface, taking in air before returning from whence they came. The salamanders do not like you to approach as they emerge from the riverbed. If you get too close, they will start to either retreat or shoot off in another direction. So, you really are better off backing away a little and being less intimidating. If you are patient and have a touch of luck, you may encounter one of the salamanders out in the open. If you do, then all of your stalking skills will be required to approach them. Taking your time can get you close enough for some nice close-ups of these most interesting creatures. The first thing you will need is a guide, because without one, your chances of seeing a Japanese giant salamander are almost zero. Not only that, these animals live in rivers in rural Japan where almost nobody speaks English, or any other language come to that, and so you really do need a Japanese guide. For my trip, I was very fortunate to be helped by my dive buddy, Martin, who lives in Tokyo and is fluent in Japanese, having grown up with an American father and a Japanese mother. Martin put me in touch with Yoshihiro Ito, who is the Japanese “salamander whisperer” and one of the nicest people you could hope to meet. Ito san turned a life-long obsession with the wildlife of Japan into his full-time occupation a few years ago, giving up a good job as a sales manager in the process. To see the giant salamanders, we had to go to the city of Gifu, the capital of Gifu Prefecture in the Chubu region of central Japan, which required a journey of just over two hours on the excellent Shinkansen bullet train from Shinagawa station in downtown Tokyo. 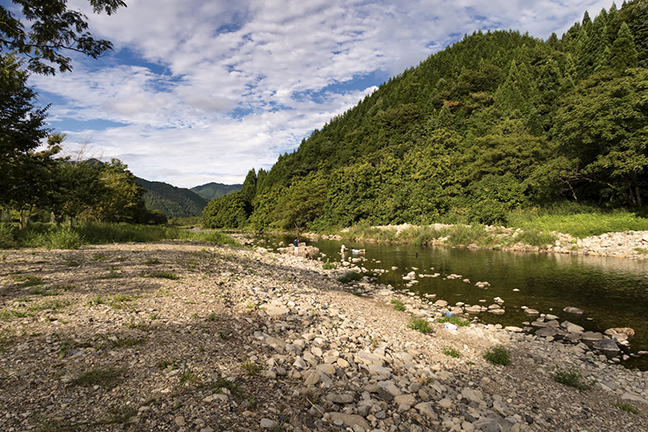 Ito san met us at Gifu station and drove us up into the mountains and the small village of Wara, where he knows all the spots in which the Japanese giant salamanders burrow down amongst the rocks in the riverbed of the local river. Once kitted up in drysuits (the water is cold), Ito san guided us to the best spots, and we began our routines of rock-watching, followed by a few minutes of intense activity as the salamanders came up for air. We spent two days around Wara. Then, on the third day, Ito san took us to another river where he knew how to find the regular “baby-sized” salamanders. For me, the opportunity to stay in a local Ryokan-style country inn was nearly as good as the experience with the salamanders. It has been on my “to do” list for many years, but as my Japanese is limited to asking for a beer and saying thank you, it was just too hard to do. Traveling with Martin and Ito san, however, made it all happen! We ate Japanese style in the inn’s dining room with other travellers who were passing through the area, and it was just great. The very best time to see the Japanese giant salamanders is during their mating season in late August when the sexually mature adults migrate up stream into the mountains to spawn and lay their eggs in “dens.” The larger males guard those dens and are known as “denmasters.” They will mate with numerous females during the season, while smaller males will often to sneak into the dens and fertilize the eggs. You have two options and both involve Ito san. You can go directly to him, but do not expect perfect communication, as his English is not fluent. However, you can absolutely rely on him to do everything possible to make sure you have a good trip. Ito san’s email is: yoseadiv@hyper.ocn.ne.jp. Asia correspondent Don Silcock is based in Bali, Indonesia. For more information and insight on the Japanese giant salamanders, plus extensive location guides, articles and images on some of the world’s best diving locations, check out his website at: Indopacificimages.com.